We are making “KISStory” while on this tour! 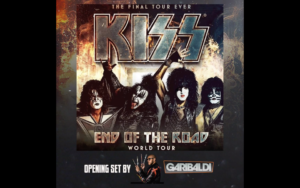 The “End Of The Road” Kiss tour is their absolute last, and not only do they want to go out with a bang, they want to go out as the most generous. My opening 30 minute set consists of 3 paintings, and the last being KISS depicted as they will hit the stage right after me. The band signs each painting and is soon put up for online auction benefiting local charities in the cities we visit. Below will be a running list of links to bid on these pieces of “KISStory”! Each painting is 8′ wide by 5′ tall. I’m not sure if we’ll be there yet. Announcement about future dates soon! You were awesome! My friends and I saw you at “The Forum” and I think it is a very cool way to open a KISS show! Keep up the good work. How do we meet and greet you in Kansas City next week? Any idea when the Corpus paintings will be available to bid on? You were awesome! I must admit my first reaction was “what the hell is this?” but you quickly had us mesmerized. We just updated the links. Visit garibaldiarts.com/kisstory! Will U be performing in Memphis tonight? Unfortunately we were not scheduled for that show. I will be at the Nashville show! Good evening. I have been patiently waiting for the forum piece of art to be put up for auction. Any word on when that will be? Thank you excellent work. Are the paintings from the OKC event available? Yes, all paintings besides the Kiss painting are available. Which one were you interested in? Is there any word on the Anaheim painting being auctioned ? Looks like I won the painting for the forum in last nights auction. Do you know how I can pay for it or how to get it? We are very excited to have that in our home! They have not provided us with the right link for the auction. Hopefully the provide it soon. Do you have any photos of the band signing this painting? If so could you email them to me. Just saw you in Minneapolis last night. When will the Minneapolis paintings be up for auction? You are amazing! In regards to the painting? We post links when they provide it to us. If the link is not updated, they have not provided it. Awesome show last night in Sioux Falls!!! Will all three paintings be auctioned off at some point? Yes, the painting is donated to a local charity and we wait for them to provide info when it will be auctioned off. I have tried emailing Ashley to inquire about pricing for your Dallas paintings. I have yet to receive a response. Can you give me some pricing info? Also any idea on when the Dallas Kisstory auction will be open for bidding? I will be sure to have here follow up with your email. Hi David. We saw you in Grand Rapids, MI last Saturday and were blown away by your performance and artistry. Nicely done! Will you be selling any smaller prints of the Kiss paintings? I don’t have room for a 5×8′ painting in my house, but I bet a lot of people would pay good money for a smaller print, maybe 2.5×4′ or 3×5′. It would look really sweet in my man-cave and could raise a lot more money for charity too! David you were amazing in Louisville KY, I was stunned by the paintings. The wife and I loved every minute of it. I was there and that was amazing how he painted the pictures. I would love to know the site for the auction. The Student Veterans Association of Yuba College invites you to our 3rd Annual Dinner & Silent Auction to raise funds for the Veterans Resource Center on campus. This year, our theme is “Welcome Home from Vietnam”. This is your chance to take part in a long-awaited welcome home event for every Vietnam Veteran we can get to come out! All Vietnam Veterans get a free ticket to the event. Contact the Veterans Resource Center at 530-741-6822 to purchase your tickets! ALSO, we need donated items for the auction!!! Many of our usual donors were unable to donate this year, so please consider a donation. We can pick up your donation with a little advance notice. Auction is in 21 days, so please call us if you can donate. My son, sister, and I thoroughly enjoyed watching you perform and paint at Columbus Nationwide Arena last night. Your art is fantastic. So looking forward to see you opening for KISS in Montreal, Toronto & Ottawa! Fingers crossed that we’ll bump into you during our Ultimate VIP backstage tour with Keith. Would love to purchase a copy of your painting of Kiss you did in Detrot… All of your Paintings were breathtaking! Really enjoyed watching you perform as an artist in Detroit ! Please let us all know how we can purchase prints or a painting from Detroit with Kiss in tbe theme !! Where can I buy your painting? From kiss show. ..
Hi David!! Will you be opening for KISS in Boston on March 26th?? Hi, any info/link on the auction for the paintings done in Montreal & Toronto ? I was at the Toronto show and WOW, any timeframes for the local Toronto charity to post their link so I can bid on the print? What about the paintings from the Long Island show? Any news about Montréal? I would like to bid on the painting.